Lions (Panthera leo) are pack-hunting carnivores that sometimes cooperate to bring down prey much larger than themselves. Females, unencumbered by the bulky mane of the males, do most of the hunting. 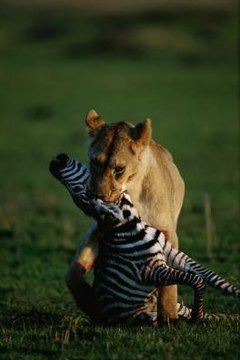 Partial to large ungulates, lions will also capture small prey or scavenge the kills of others when the opportunity arises. Lions may not hunt daily; when a kill is made, they gorge themselves and spend the next few days sleeping and digesting. Adult male lions typically weigh about 400 pounds, while the females are somewhat smaller. Scientists found the largest lion ever recorded in Kenya -- it weighed almost 600 pounds. To get this large, lions must eat an enormous quantity of food. Studies of wild lions have estimated that they eat between 10 and 25 pounds of food per day. The Association of Zoos and Aquariums recommends slightly less for captive animals, and suggests that the average male requires 8 pounds of food per day, while females require about 6 pounds.